Eat Black Bean Hummus with chips or just a spoon. 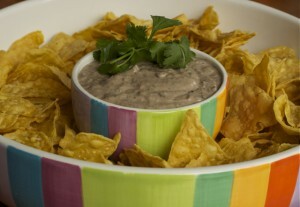 I’ve been on the hunt for a good black bean dip recipe for a long time and, drumroll please, I found it, baby! Or, actually it found me on Twitter. It started out innocent enough, dipping in a few tortilla chips. And then, Brian suggested we just get some spoons. And then, the Black Bean Hummus was all gone. Yu-um. The idea of putting in tahini and transforming black bean dip into hummus is brilliant. I loved the creamy, nutty thickness. If you aren’t familiar with tahini, you should pick some up and experiment. Tahini is roasted sesame seed paste/butter and is usually found near the peanut butter at grocery stores. My version of the original recipe ramps up the flavor with more jalapeño, garlic and cilantro. I’ve never understood “seeding jalapeños.” That takes away all of the heat! Place all ingredients in a food processor and process until smooth. Spoon into a bowl and serve at room temperature with tortilla chips, pita chips, bell pepper slices or a spoon.